Editor’s Note: This is our second installment of the The Saylor Journals – Saylor Student Profiles. These profiles provide an opportunity to meet the variety of people that are studying our courses. We hope that their experience will inspire you to take a new course! If you’re a Saylor.org student and would like to be featured in this series, please drop us a line. Meet Angela Moore! Angela is a lifelong learner who stumbled upon Saylor.org by researching free online courses. She has a passion for literature and writing and aspires to teach and help guide people through online courses. 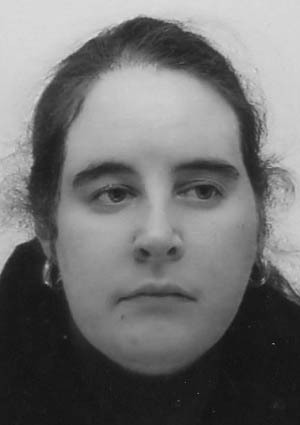 You can find Angela’s published poems on Birmingham Poets Online and Forward Poetry. Saylor: Hi Angela! Tell us about you – who you are, what you’re up to, and how you came to study at Saylor.org. I’m a life learner with the aspirations of becoming a writer and feeding knowledge into my brain. I’m twenty-eight and from Birmingham in the UK. I messed up my education as a teenager by moving from school to school, unable to settle. I dipped in and out of college in my lower twenties, and when I had my operation on my knee at the age of twenty four I was left with mobility problems. Though, it came at the right time as I knew I had to do something that was motivating and then was born the beginning of the digital educational age. I signed up to the Open University in 2009, and I have until 2015 to complete my degree. However, I wasn’t taught properly at school, no grammar advice and I was getting Cs in English and no proper essay preparation given. I keep failing on these two things, but I’m working on it – I’m determined and I will succeed. Ever since this new innovation has begun I’ve learned a lot more and my online learning as improved with facilities like yourselves (Saylor, of course)! 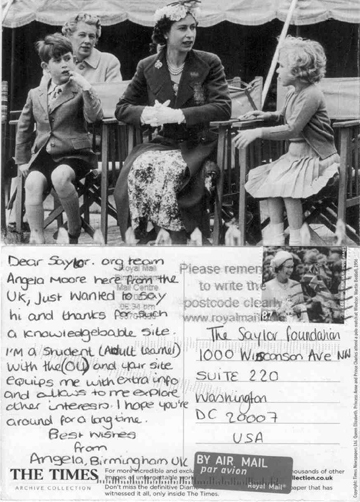 Angela's postcard to the Saylor Foundation! I have learned and gained three diplomas with alison.com in Legal Studies, English Literature and Psychology; I’m continually studying with these and at the moment I’m working through Child and Youth Studies. Since then, I’ve decided to focus more on psychological things and I’m attempting a short course in this area next February. Until then I was more interested in the English Literature field, I still am but the psychological ethnics give me a deeper insight. I began the Sociology course run by Coursera on the 11th June which is nerve racking when I’m new to the area but, it’s fun and more focus in the psychological field. I’ve been working on Saylor and printing the most important information out for future reference. I’m working through the English, Psychology , History, Philosophy disciplines. To coincide the study with Saylor I have attempted to make notes for Yale’s free open courseware courses and Udemy. So far, I have two published poems and I’m midway through writing a psychological novel, which I’m interested in publishing and would like to do so before I turn thirty (October 2013). I aim to complete all my ongoing courses that I’ve started, including Saylor’s by Summer 2013 and who knows where it will lead? I’m always researching the Internet to find more or use things alongside study, I’ve particularly found the writing centres a great resource. This started when I signed up with the UnCollege and began to find educational resources to aid learners/teachers/educators in their educational prospects. The more knowledge I absorb, the more I’d like to know therefore, I will be a lifelong learner for the rest of my life! I have some big ideas after being given the chance to study, which I’m planning on making reality when I complete my degree – and as a taster these free online courses/knowledge won’t go to waste. Saylor: What have you liked about the courses that are available through Saylor? I thoroughly enjoy them, they are fascinating subjects and they are uniquely mapped out with everything to assist someone new in the particular subjects. I enjoy the links and the availability to learn more about the subject, by adding them to the favourites tab on a PC. Saylor: Which courses have interested you the most? I’m mostly interested in the Literature courses, but I plan to work through the Psychology, Political Science, Philosophy and possibly the Art History. Also, I’m interested in the History, but at the moment I see that most of it is about the US, I will still work through it but it would be nice to have a wider focus; such as, Mythology, Victorian era, Elizabethan I era, World History and more. Saylor: What are your plans and goals for when you complete the courses? Saylor: Thank you for sharing your story with us and good luck on your future studies! We are looking forward to seeing more of your published works! Diversity, Usability, and Collaboration at Wikimania 2012Monday Morning Digest: Holy MOOCs!